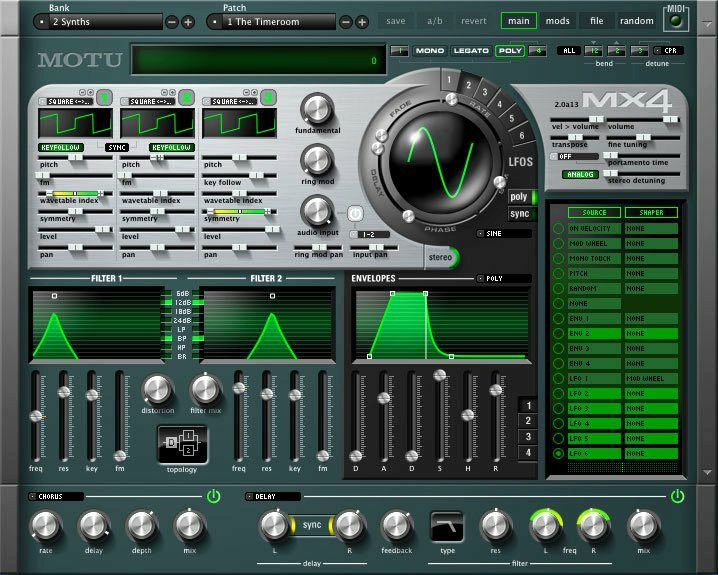 MOTU has just announced their brand-new synth plug-in MX4, and I was privileged to be on the sound design team for it, programming a good number of the patches. Click on the picture to the left to see it full-size. Meet the new instrument plug-in powerhouse for your studio. Inspired by legendary subtractive synthesizers, MX4 combines several core synthesis techniques in a unified, hybrid synthesis engine that delivers fresh and vintage sounds alike. 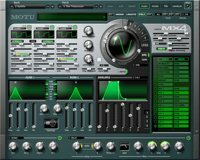 As you explore its many banks and hundreds of presets, you’ll soon rely on MX4 as your “go-to” instrument. Fat basses, nasty leads, analog pads, vintage electronica — it’s all at your fingertips and conveniently saved with your host application projects for instant recall. Tweaking sounds is fast and easy with clearly presented controls in one window — but with a depth and sophistication true synth programmers will appreciate. Create your music with pristine 32-bit sound quality, unlimited voices and unlimited polyphony (as much as your host computer allows). MX4‘s flexible programming and advanced modulation architecture provide the intimacy of a vintage synth, the flexibility of a modular synth, and the innovation of a virtual synth.